Surface Pro 6 FAQ (Surface Pro 6 Q&A): Everything you need to know! 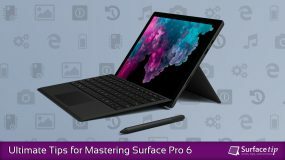 Home » Devices » Surface Pro 6 FAQ: Everything you need to know! Microsoft Surface Pro 6 is a great 2-in-1 device with the most powerful performance Surface Pro ever built by Microsoft. It packs with a quad-core 8th Generation of Intel Core processor. It has better performance, longer battery life, better display, new black color design, and more. 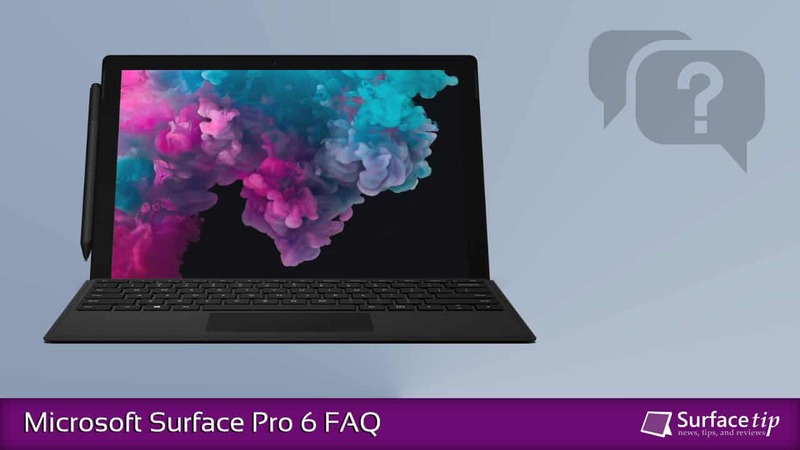 It’s better to know more about this device before you make a purchase decision, and here’s our comprehensive Microsoft Surface Pro 6 FAQ that should clear up all your queries. We will try to cover all Surface Pro 6 question segments including display, battery, performance, software, and design. 1How much does a Surface Pro 6 cost? 2What are the dimensions of the Surface Pro 6? Microsoft Surface Pro 6 has dimensions of 11.50” x 7.9” x 0.33” (292 mm x 201 mm x 8.5 mm). 3How much does the Surface Pro 6 weight? 4What ports are on the Surface Pro 6? 1 x Surface Pro Type Cover port. 5Does Surface Pro 6 have a camera? 5.0MP front-facing camera with 1080p Skype HD video. 8.0MP rear-facing autofocus camera with 1080p full HD video. 6What processor is in the Surface Pro 6? Graphics: Intel® UHD Graphics 620. 7Does Surface Pro 6 include pen? No, Surface Pro 6 doesn’t include a Surface Pen out of the box. You will need to purchase separately or use old Surface Pens from previous models. The latest Surface Pen costs about $100 which supports 4,096 levels of pressure and tilts support. 8Does Surface Pro 6 come with a keyboard? No, you will need to purchase the keyboard (Surface Pro Type Cover) separately. It costs about $100 for the black type cover and $130 for burgundy, platinum, and cobalt blue. 9When was Surface Pro 6 release? Available on October 16, 2018. 10Can you upgrade RAM on Surface Pro 6? No, you can’t upgrade your Surface Pro 6 RAM as it was soldered directly onto the motherboard. 11Is the Surface Pro 6 fanless? Surface Pro 6 with Intel Core i5 is fanless. Surface Pro 6 with Intel Core i7 have a fan. 12What size is Surface Pro 6’s display? Surface Pro 6 has a 12.3-inch PixelSense™ Display. For more information, check our Compare all Surface displays. 13What is the resolution of Surface Pro 6? Surface Pro 6 has a resolution of 2736 x 1824 and a pixel density of 267ppi (pixels per Inch). For more information, check our all Surface’s display comparison. 14Does Surface Pro 6 need a screen protector? Even Microsoft Surface Pro 6’s screen is made of Corning Gorilla Glass, it still prone to scratches. You’d better pick one up for your Surface Pro 6 to protect it from scratches. 15Does a screen protector reduce the responsiveness of Surface Pro 6? Yes it does, it much or less noticeable depending on what type and thickness of screen protector you put on it. For the best option, you should look for a slim tempered glass screen protector, as it’s smooth to the touch and reduce responsiveness issue. For more information, check out our Surface Pro 6 screen protector buyer’s guide here. 16What is the default Surface Pro 6 display scaling? Micorosft Surface Pro 6 has a default display scaling of 200%. 17What is the aspect ratio of Surface Pro 6? Surface Pro 6 has a 3:2 aspect ratio. 18What is the Oleophobic Coating on Surface Pro 6? Microsoft Surface Pro 6 screen glass comes with a 10nm oleophobic coating. It is an oil repellent coating which protects the screen against fingerprint smudges and reducing screen glare. 19How long does the Surface Pro 6 last? Microsoft Surface Pro 6 last 13.5-hours of battery life for local video playback tested by Microsoft. 20What is the battery capacity of Microsoft Surface Pro 6? Microsoft Surface Pro 6 has a battery capacity of 45.0 Wh (5,940 mAh, 7.57V). For more information check Microsoft Surface battery comparison here. 21How do I charge my Surface Pro 6? 22Can I charge Surface Pro 6 via USB? No, USB port on Surface Pro 6 is used for data transfer only. 23Can Microsoft Surface Pro 6 run Photoshop? Absolutely yes. Microsoft Surface Pro 6 equipped with the latest quad-core 8th Gen Intel® Core™ processors combined with Intel® UHD Graphics 620, is powerful enough to handle most tasks available on Photoshop. 24Can the Surface Pro 6 run games? Yes, you can play many game titles at low or medium settings. 25Can you code or programming on Surface Pro 6? For writing code, Microsoft Surface Pro 6 is more than powerful enough to handle most code editor such as VS Code, Atom, or Notepad++. Combined with its great tactile keys, it’s a perfect mobile development machine you want to have. It’s also capable of compiling complex codes on Visual Studio or Android Studio as well. 26Can you play Fortnite on Surface Pro 6? Surface Pro 6 Gaming Review – Fortnite, GTA 5, Civ 6 – Can it Game? 27Is Surface Pro 6 64-bit? Yes, Microsoft Surface Pro 6 uses the 8th Gen Intel® Core™ processors which supports 64-bit instruction and it does come with a 64-bit version of Windows 10. 28Is Surface Pro 6 good for drawing? Yes, drawing is really smooth on most apps such as Adobe Photoshop, Windows Ink, Sketchable, Bamboo Ink, OneNote, and more. It supports the latest Surface Pen with 4,096 levels of pressure and tilts support. 29Is Surface Pro 6 good for students? Yes, it is. With Surface Pro 6, you can take advantages of all kind of note taking including typing, drawing, and touch. On top of that, you can also record the lecture and take a picture with an 8.0MP rear-facing autofocus camera. You will never get stuck on taking note of all kind of information you want. 30Will Surface Pro 6 run Office? Yes, Surface Pro 6 comes with a Microsoft Office 365 30-days trial. Office apps will run smoothly on Microsoft Surface Pro 6. 31Will Surface Dock work with Surface Pro 6? Yes, Microsoft Surface Pro 6 work smoothly with Surface Dock via Surface Connect port. 32Does Surface Pro 6 run Windows 10? Yes, it does. Surface Pro 6 shipped with a full version of Windows 10 Home or Windows 10 Pro. 33Can you download apps on Surface Pro 6? Yes, you can. You can download safe and Microsoft verified apps and games from Microsoft Store. Since it’s a full version of Windows 10, you can also download and install any apps from any source you’d like to. 34Does Surface Pro 6 run full Windows? Surface Pro 6 for consumers: comes with Windows 10 Home. Surface Pro 6 for business: comes with Windows 10 Pro. 35How do I reset my Surface Pro 6? To reset your Surface Pro 6, plug in your Surface Pro 6 so you don’t run out of power during the refresh. Open Settings > Update & Security. Under “Reset this PC“, select Get started. Choose either Keep my files or Remove everything. If you choose to Remove everything, you can choose to clean only the drive where Windows is installed and all drives. Next, you will have the option to just remove my files and remove files and clean the drive. The option to clean the drive is more secure but takes much longer. For example, if you are recycling your Surface, you should clean the drive. If you are keeping your Surface, you just need to remove your files. Surface Pro 6 will restart and the Surface logo appears during the reset process (this can take several minutes). 36Is Microsoft Office free on Surface Pro 6? No, the 12.3-inch Surface Pro 6 comes with a free Office 365 30-days trial, so you need to purchase a subscription to continue using the full Office suite when the trial period ended. 37Does Surface Pro 6 need antivirus? In most cases, you don’t need a third-party antivirus. Windows 10 on Surface Pro 6 has a built-in Windows Defender for virus and threat protection out of the box. It’s free and receives definition updates regularly via Windows Update. 38What is the difference between Surface Pro 4 and Surface Pro 6? Released Date Surface Pro 6 released in 2018 while Surface Pro 4 released in 2015. Peformance Surface Pro 6 uses quad-core 8-Gen Intel processors while Surface Pro 4 uses dual-core 6-Gen Intel processors. Battery Life Surface Pro 6 has 13.5 hours of battery life while Surface Pro 4 lasts 9 hours of battery life with the same video playback. Windows 10 Edition Surface Pro 6 comes with Windows 10 Home while Surface Pro 4 comes with Windows 10 Pro. Design Surface Pro 6 has a new air vein design and a more rounded edge compared to Surface Pro 4. Kickstand Surface Pro 6 has a 165 degree kickstand while Surface Pro 4 has a 150 degree kickstand. Weight Surface Pro 6 weight at between 770g to 784g while Surface Pro 4 weight at between 766g to 786g. 39Is Surface Pro 6 a tablet or a laptop? It’s a 2-in-1 tablet or laptop. It can function as a tablet and also a laptop when connected to a Surface Pro Type Cover. 40What is the company that makes Surface Pro 6? Surface Pro 6 is a product among other Surface-branded products that are made by the Microsoft company. We appreciate hearing your thoughts, questions, and ideas about “Surface Pro 6 FAQ: Everything you need to know!”. Please post respectful comments and on topic. We will be replying back to you as soon as possible. Share your idea about "Surface Pro 6 FAQ: Everything you need to know! ".